Source not provided. The flag appears to bear the same central logo as that presented above. The question was raised if this might be a group in New Zealand (the flag does state "Aotearoa" on it). Concerning the i-Kiribati flag marked "Aotearoa", though I cannot make an identification of it, I can perhaps give a further piece of information and make a guess as to what it is. 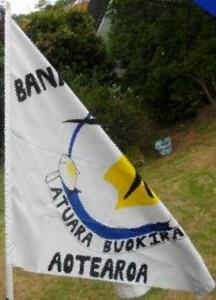 The motto shown on the flag, "Atuara buokira" is an i-Kiribati phrase meaning "our God, our help", and is the motto of the Banabe council (see http://books.google.co.nz/books?id=VbNh_ewi6zsC&pg=PA126&lpg=PA126&dq=atuara+buokira&source=bl&ots=U8vEwGNhPJ&sig=eYbNbFHyFGVCLHzpe1qYPZdd5SE&hl=en&sa=X&ei=wVNEVKzGC4v38QWHv4HwBQ&ved=0CB4Q6AEwAA#v=onepage&q=atuara%20buokira&f=false). It is quite possible this is the flag of a cultural group representing Banabe at one of New Zealand's annual Pasifika cultural festivals, which draw together cultural groups from throughout Oceania and have been held in Auckland every year since about 1990. Here is a short article on this year's festival http://www.nzherald.co.nz/nz/news/article.cfm?c_id=1&objectid=11215292. The phrase "our God, our help" is commonly seen on anything Banaba/e. I've also seen it on a sport uniform somewhere. Can I suggest the simpler option that this is the flag of a Banaban Community of/in New Zealand?